Check out this rugged pair of Stars and Stripes worker Cowboy Boots. These boots make a real statement with their worn, rugged styling and two tone colour scheme. 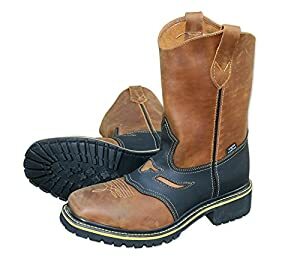 These lovely mens cowboy boots are made from really high quality cow hide, have the famous Goodyear Welted Sole and steel toe caps. The embroidery on these boots is second to none. These boots can be worn for a night out or for a hard days work on the stable, they are tough, comforable and stylish.